Seems like it’s almost $21/bf. Considering it is being my banned by CITES that’s probably what it coming too. I hate Bulbinga I bought some about 10 years ago when the stores were flooded with it all the huge slabs. Apparently someone cut down a ancient forest. I found out the hard way I’m and deathly allergic to Bulbinga. I did make a nice step stool that cat uses to climb up to take hers naps. That’s just over $22 per bd-ft. My local Woodworker’s Source store has already raised the price from $15 to $20, so if it looks like something you can make good use of, it’s worth it. 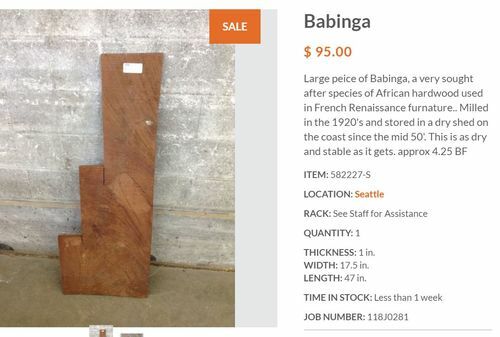 Edit: They should be penalized a buck or two for calling it babinga though. It’s bubinga. Don’t really have a use for it now but I still have about $100 bucks left after the $200 my wife put on account there as a Xmas gift. Thought it’d make for some nice veneer. I thought it was bubinga but what do I know? Thanks. I think I’ll grab it.